In this article on Life Balance, we look at various aspects of life – physical, mental and spiritual – that contribute to a sense of being in ‘balance’. When we are keeping a healthy overview of what is important to us, and making timely and empowering choices in the present moment about how we spend our time, this is what contributes to ‘life balance’. 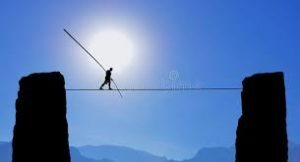 But, if trying to maintain balance in your life makes you feel like a tightrope walker, you’re not alone. And my guess is that you don’t want to feel this way any more. If you get to the stage that you have so many demands on your time and energy, it could feel like walking a tightrope – and falling off. It’s time then to assess what’s going on; be attentive to the signals, and consider how you can be mindful about improving your current situation. Being in the present moment with your thoughts and actions, means you can make empowered decisions for yourself. It is about taking one thing at a time, taking a deep breath, embracing the fact that ‘you’ve GOT this’, that you have the resources and the power to do this … and then doing one thing. No matter how small it is. Just. One. Thing. Take this quiz, coming to you in two parts, to see how well you mindfully attend to some life priorities, and then consider what you can do to meet your personal definition of what a balanced life is. 6. I experience the gifts of each season: bundled-up beach walks; gardening, tramping, more time outside; camping, picnics (in the backyard), swimming, barbeques; harvesting the bounty, gathering wood, spending more time inside. If you answered False more often than True, you may want to take a look at the statements to which you answered false, and examine them closely. My clients often come to their sessions wanting to get more balance back in their lives, and realise that the question they were asking was not the right one: it is about being more aware of the pendulum swings that come with life events, and then becoming more mindful. It is being ‘present’ – mindful, curious, open, aware – that brings back a sense of life balance. You can get the second part of this Life Balance quiz in my upcoming article. Or, reach out for a coaching session.